We hear every day from industry leaders, politicians, parents, and students themselves that school is not preparing our kids for the opportunities and challenges of today. Here in Edgecombe County, we're doing something about this. 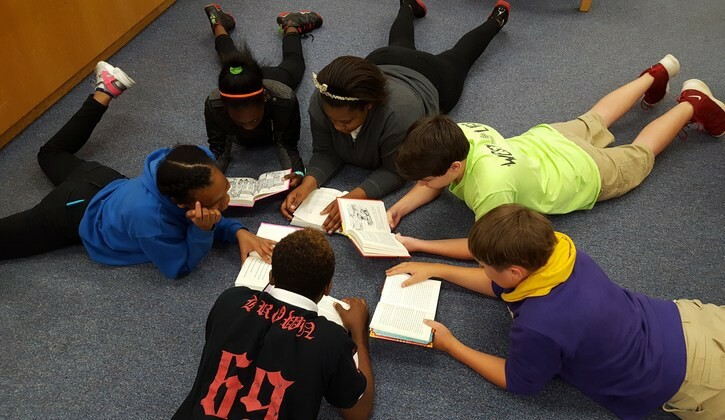 Schools across Edgecombe County are fundamentally changing what learning looks like for our scholars. Read on to learn how the North/Phillips "Micro School" of Innovation, the growing Spanish Immersion programs at Martin Millennium Academy and G.W. Bulluck Elementary, the Schools That Lead initiative at W.A. Pattillo Middle, and Opportunity Culture are transforming students' lives and the face of our community. And these are just a few of our innovations - contact us and attend the #InnovationECPS School Visits to learn more! Students, families, educators, and community members on the north side of Edgecombe County are re-thinking what school looks like. They have created a new school model - the North/Phillips School of Innovation (NPSI). The mission of the NPSI is to provide students with a liberating education that allows them to develop and pursue their passions, realize their life’s purpose, remain resilient in the face of challenges, and lead social and economic change in their family and communities. NPSI scholars will positively impact our world in their lifetime, creating a ripple for generations to come. The NPSI model has been piloted during the 2018-2019 school year with 30 8th and 9th grade student volunteers from Phillips Middle School and North Edgecombe High School. Scholars spend the majority of day directing their own learning. They engage in Design Labs, where they use the human-centered design process to identify opportunities and develop solutions to problems at the intersection of their interests and the community's needs. Rigorous content is integrated throughout the Design Labs, and is further explored in self-paced Standards Labs. On a regular basis, students delve deeply into their identities and discuss how they can leverage their strengths to make a difference in the world. As 9th grader Breyia Alston says, "I can work alone or in a group and focus my learning on my own future goals and interests. I think this is better preparing me for college." 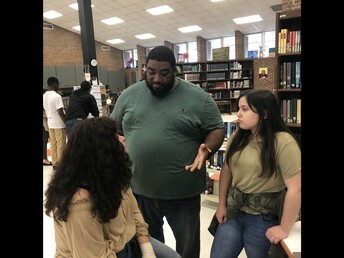 ECPS plans to expand learning opportunities like these to more scholars in the North Edgecombe HS feeder pattern next year, and to support communities throughout Edgecombe County to engage in a similar design process to "re-imagine" education for all of our scholars. Interested in learning more? 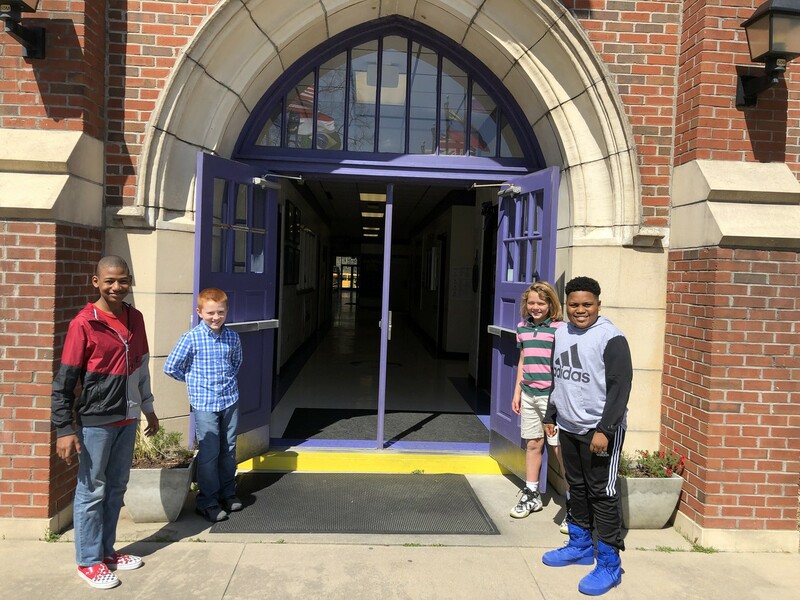 Read the front-page article in the Rocky Mount Telegram from April 10th, and contact Erin Swanson, Director of Innovation, at eswanson@ecps.us. Elementary scholars at both Martin Millennium Academy in Tarboro and G.W. Bulluck Elementary in Rocky Mount are learning Spanish AND English! Through an ongoing partnership with Participate, our young scholars are becoming bilingual - an opportunity that has the potential to transform their lives and our community. Research shows that scholars in bilingual environments have stronger executive functioning and reading comprehension skills, as well as more empathy and compassion. Both schools are accepting applicants for the 2019-2020 Kindergarten Spanish Immersion classes - contact Kelsey Ballard at G.W. Bulluck or Jennifer Craddock at Martin Millennium Academy for more details. Come join the learning and the fun! Our Spanish Immersion program is excelling! We currently have Kindergarten, 1st grade and 2nd grade immersion classrooms at G. W. Bulluck Elementary, and we are excited to add 3rd grade for the 2019-2020 school year. Our parents are continuously impressed with how fluent students are becoming in Spanish, while also improving in their English skills. We are focusing heavily on informing parents and the community about this awesome program, as our goal is to have 25 rising Kindergartners join the program next year. Our first class of Spanish Immersion scholars will be entering middle school next year! In 2019-2020, 6th grade Spanish Immersion students will participate in a daily Conexiones class, where they will continue receiving rigorous instruction in Spanish literature, culture, speaking, listening, and writing. MMA will continue to offer the Spanish Immersion program for elementary students, as well, with openings for 50 new Kindergartners! Teachers at MMA are excited about seeing their scholars’ improvement in their interpersonal, intercultural, and linguistic skills, while developing a growth mindset in academics, and most importantly, in their own lives. W.A. Pattillo Middle School is seeking out creative and collaborative solutions to challenges that affect students’ ability to succeed. 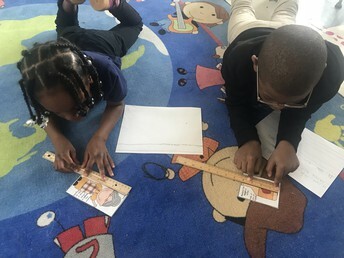 Schools That Lead (STL), a three year program backed by the The Carnegie Foundation for the Advancement of Teaching, The North Carolina General Assembly, and The North Carolina Department of Public Instruction, is currently working with 34 schools across the state, including Pattillo. “Unlike many other interventions I have heard about, Schools That Lead provides a framework that allows schools to diagnose their own problems, rather than just prescribing a one-side-fits-all solution," says STL Teacher Leader, and 8th grade math instructor at Pattillo, Vena Holub. 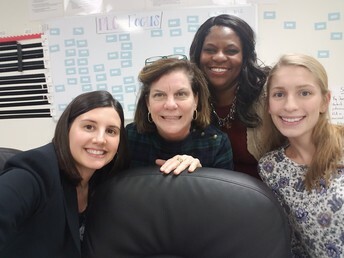 Holub and Dana Alexander are the schools’ Teacher Leaders who work on an improvement team in conjunction with the Principal, Lauren Lampron, and School Improvement Facilitator, Hazel Lewis, to target the school’s goals through Improvement Science. The idea of Improvement Science is that those who interact directly with students best understand their needs; therefore, the solution-driven approach for each school should be created almost entirely by the Improvement Team on their own. This approach starts with the impact teachers can have on small groups of students in their classrooms. “Initially, I was just excited to work with the other Teacher Leaders to build data collection tools capable of measuring the impact of small changes in my classroom. It felt good to be in a room full of so many professionals driven to deeply understand how their practices can improve student learning. Now that the whole team has been to multiple STL sessions, I can see how the Schools That Lead framework will play into individuals’ strengths across our school and eventually beyond,” said Holub. Twenty OC Teacher-Leaders ... and Growing! Three years ago, ECPS entered into a partnership with Public Impact to implement this new idea called "Opportunity Culture." Now, 20 teacher-leaders in eight ECPS schools are leading their students and colleagues to achieve phenomenal growth as Multi-Classroom Leaders, Expanded Impact Teachers, and Reach Associates! 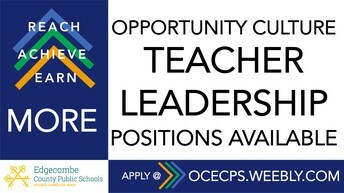 Applications are open now for 2019-2020 Opportunity Culture (OC) positions, the majority of which will be in our newly-added OC schools in the southwest area of the county. Please visit ocecps.weebly.com to learn more, and read on to learn how Opportunity Culture is making difference in our Tarboro schools! I support four teachers in middle school math and science at Martin Millennium Academy, our district's K-8 global school. Each week I observe teachers for at least 15 minutes. During the observation, I have the opportunity to provide teachers with real-time feedback. Following the observation, I meet with each teacher individually for a coaching session. During the coaching session, we focus on the teacher’s strengths and areas of growth. We also practice key action steps to improve their areas of growth. I use key concepts from Leverage Leadership, Get Better Faster and Teach Like a Champion to guide the coaching sessions. In addition to observing and providing feedback, I meet with teachers to focus on lesson planning. During the lesson planning sessions, we ensure that lesson plans are data-driven and curriculum-driven. I also meet with teachers to plan for their intervention and enrichment period. Each week I facilitate data-driven PLCs, and I provide professional development specific to teachers' individual needs, as well. How do students experience Opportunity Culture? Students are able to experience OC at MMA in different ways. Throughout the week, the teachers and I schedule opportunities in which I co-teach lessons and assist students at groups, in partners or independently. Students ask questions and share their work with me regularly. At least twice a week, I pull a small group of students during our scheduled intervention and enrichment time to provide additional support or extend student learning. I also have the opportunity to meet with students on an individual basis to discuss their academic progress. One of the biggest impacts I have seen so far is a change in our school’s culture. Coaching, feedback, collaboration and reflection have become the norm for our school. In addition, our benchmark scores have increased significantly from last year to this year, and we are excited to see how much our students have grown by the end of the year! I support four science teachers at Tarboro High School. Each week, teachers receive a weekly 20 minute observation and a coaching session. During those sessions, we discuss ways in which the teacher can improve. I use the framework from Get Better Faster, which uses the "See it, Name it, Do it" approach. I also provide opportunities for myself and teachers to co-teach. Co-teaching provides teachers with a model and also helps me to reach more students. Students are able to experience OC at THS by seeing me enter their science classes on a regular basis. Students feel comfortable asking me questions when their teacher is occupied with another student. This semester I am teaching a section of Biology, which enables me to greatly impact a group of students. I am able to combine this class with other sections of Biology and co-teach with that teacher. Fall 2017 End of Course assessment data showed that only 9% of Biology students were proficient, and 12.3% were proficient at the end of the 2017-2018 school year. 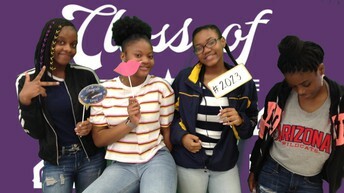 After the addition of OC to Tarboro High School, preliminary data showed that we grew by at least 24% from the previous fall semester. The OC model has greatly impacted the process of learning here at Tarboro High School. See the Opportunity Culture approach to teacher leadership in action. Visit the new hands-on STEM lab. Joining the Scholar Teachers program has been the best decision I have ever made. Taking Teacher Cadet classes with Mrs. Leigh Ann Webb that solely focus on the profession with which my passions lie has been both a dream and a learning stretch. I have also had the wonderful opportunity to intern for the past two years in Gay Norville’s kindergarten/first-grade class at Princeville Elementary. I have met a lot of amazing educators from ECPS who are helping all of us Scholar Teachers to "learn the ropes." 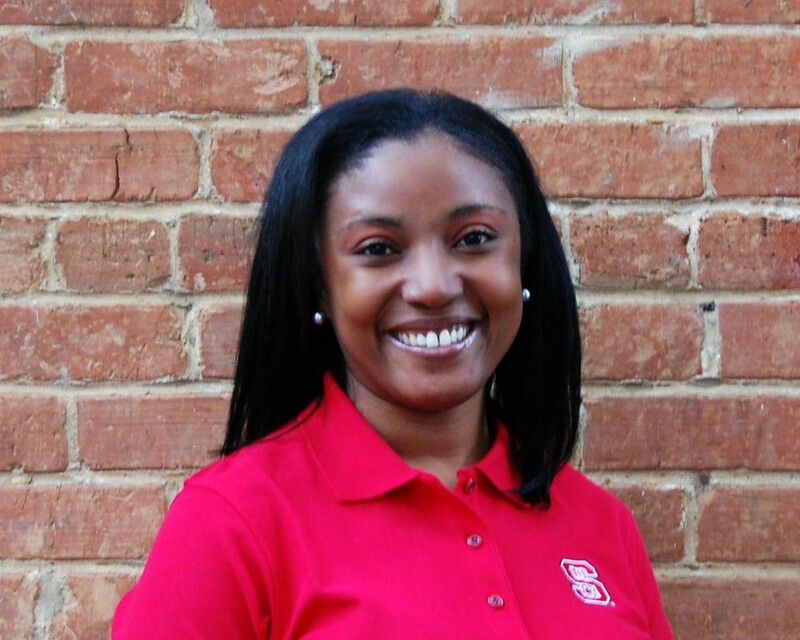 In a lot ways, the Scholar Teachers Program has helped me solidify my decision to become a teacher and teach in Edgecombe County Public Schools. I look forward to attending Barton College in the fall of 2019 and returning to teach in Edgecombe County one day soon! Students in Ms. Atkinson’s Exploring Business, Marketing and Entrepreneurship class (BU20) at West Edgecombe Middle School started a t-shirt and mug design business this semester. 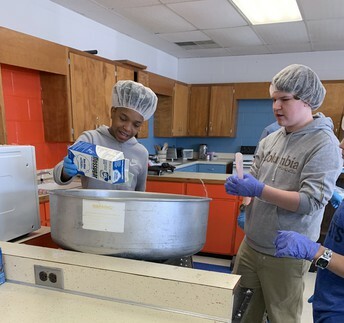 The goal of the business is to allow students to have hands-on, project-based and work-based learning experiences that connect academic, technical, and workplace knowledge and skills. Before students were able to start the business, they learned the functions and purpose of business, how to market products, and about entrepreneurship. 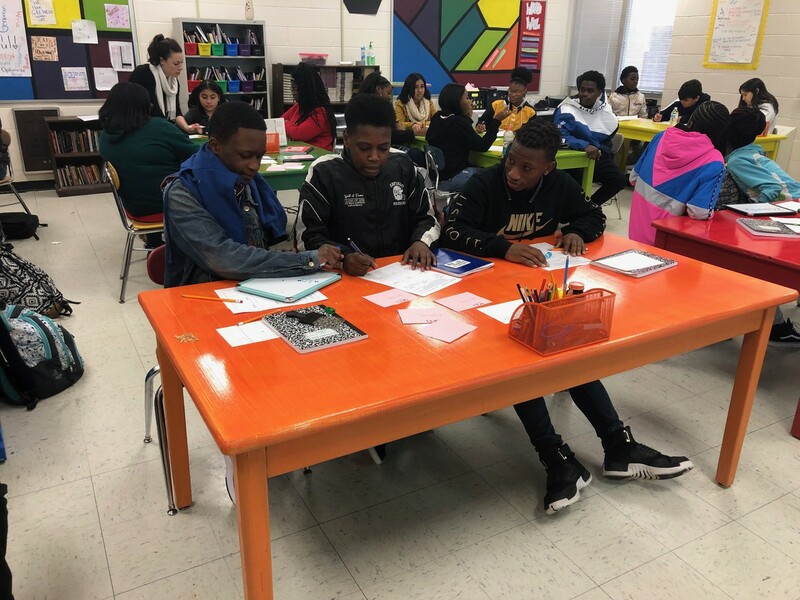 Thanks to CTE Director, Sheila Porcher, the classroom was flipped into a more flexible environment and students were able to get supplies needed for their start up business. Before students could use the equipment, they learned terminology and techniques on proper usage. The students also use their math skills to calculate expenses for supplies and how to determine what to charge customers in order to make a profit. Head West to purchase your gear today! With several new STEM-related businesses and over 3000 jobs coming to Edgecombe County and the surrounding area, our focus on STE(A)M education continues to grow! 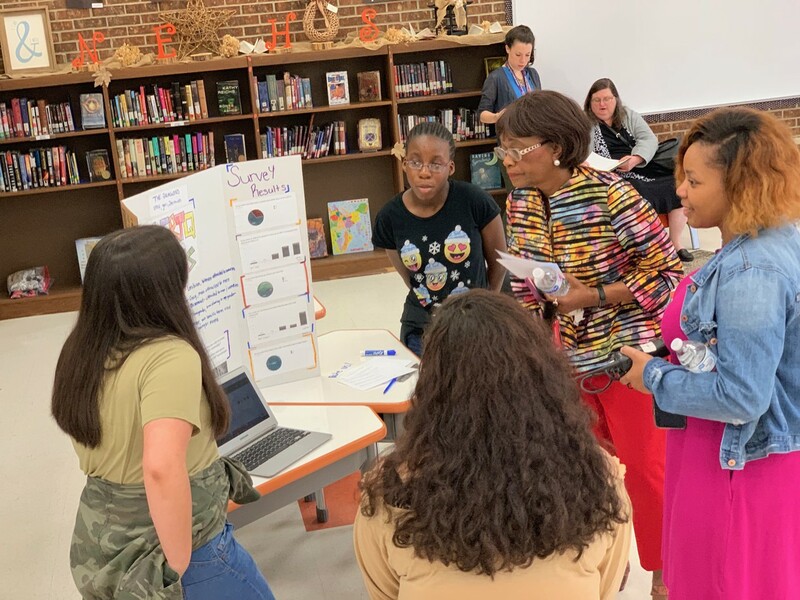 Most recently, middle schoolers from each school in the district competed in the second annual Twin Counties STEM Design Challenge (pictured here), which marries literacy, STEM, and 21st century skills. 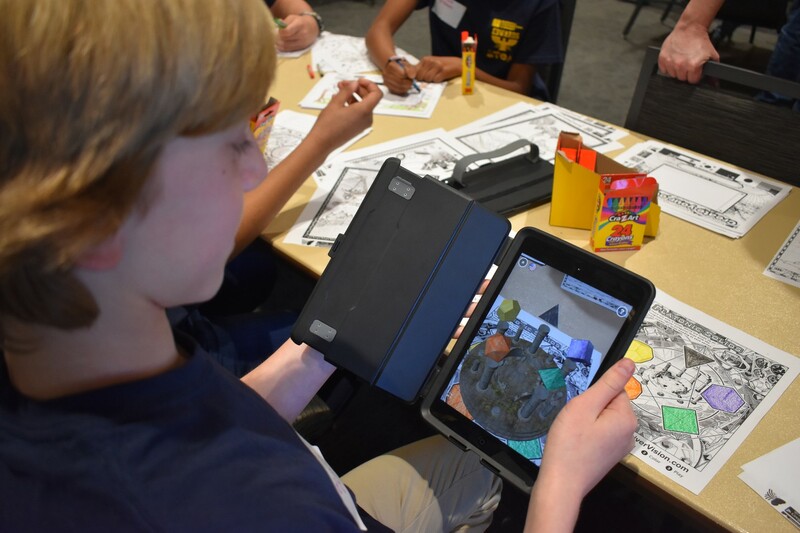 Hosted by the Strategic Twin Counties Education Partnership (STEP) in collaboration with both ECPS and Nash-Rocky Mount Schools, the STEM Design Challenge engages eight local companies as industry coaches for the middle school design teams. Read more about this exciting event! This summer, we will be offering FREE Amplify STEM camps for students in grades 3-12, as well as a new summer enrichment program for high schoolers through a partnership with ENC STEM. 40 ECPS high school scholars will have the opportunity to attend a rigorous, two-week long ENC STEM camp, and then apply to extend their learning for another week as residential students at the NC School of Science and Math! Stocks Elementary students get down to work in their new STEM Lab on a daily basis - come see it in action on May 14th! Scholars and teachers at Princeville Elementary are developing their own vision for STEAM in preparation for the opening of their new STEAM-themed school next year. Martin Millennium Academy recently hosted a Duke Energy Science Night to increase awareness of STEM disciplines and careers. Carver Elementary, South Edgecombe Middle, and SouthWest Edgecombe High just hosted their very first collaborative STEM event, "It's a Tech Life on the South Side." 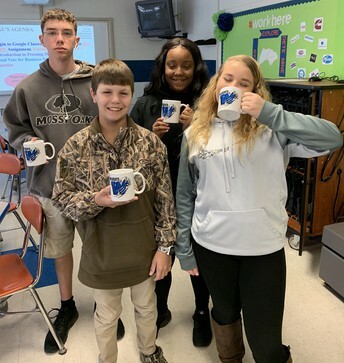 West Edgecombe Middle opened their Learning Commons to members of the Rocky Mount Chamber of Commerce, who were thrilled to see the integration of technology and 21st century skills at the middle school level. Coker-Wimberly Elementary is combining STEM and project-based learning (PBL)! The Kindergarten students designed and presented the "bus of the future" in their most recent PBL unit. Their bus will help increase student learning, lower the bus costs for ECPS, and enhance bus safety for all students. 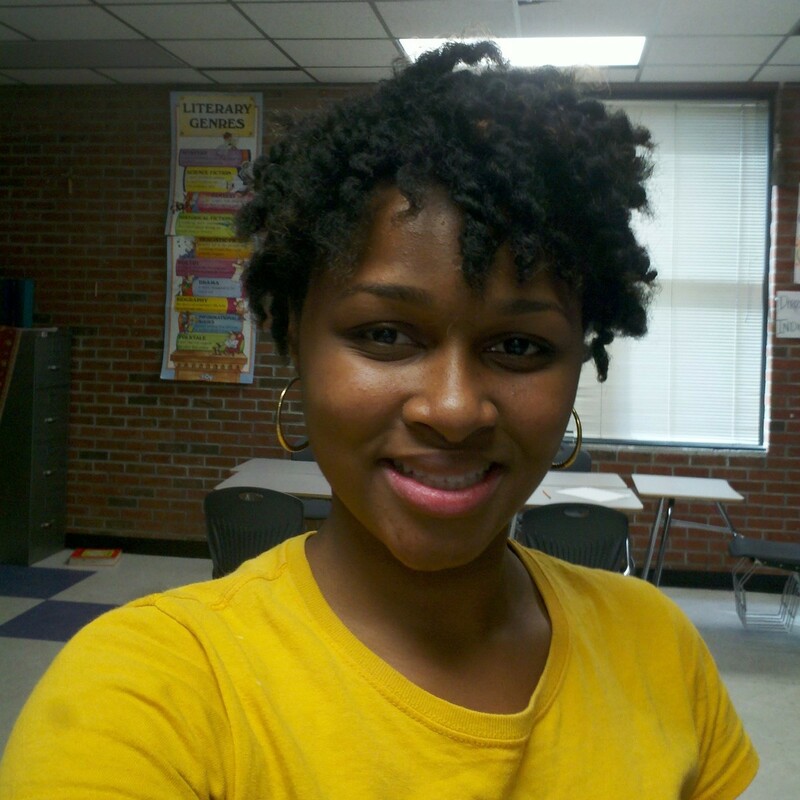 Phillips Middle's Multi-Classroom Leader, Casandra Cherry, received the prestigious Burroughs-Wellcome Fund Career Award for Math & Science Teachers. She will use funds from the award to promote maker-centered learning throughout ECPS. The FIRST Robotics team at North Edgecombe High competed for the first time this spring, with support from a dedicated group of Cummins Rocky Mount Engine Plant engineers. ECPS continues to partner with the Rural Opportunity Institute (ROI), a collective formed by two former teachers with the goal of building a trauma-informed, resilience-focused rural eastern North Carolina. Recently, our school counselors took part in an ROI-sponsored Reconnect for Resilience training, where they learned simple language to explain how trauma affects the brain and the nervous system, along with a set of practical strategies to promote resilience. ROI is modeling what it means to truly design with, and not for, a community. The SEMS school leadership team came up with the idea of offering Academic Support classes to all scholars after reviewing key data points (academic, discipline, and attendance) from the 2017-2018 school year. They identified the immediate needs of their students, while also considering how to equip scholars with the mindsets, skills, and dispositions to reach the ECPS Graduate Aims in the future. 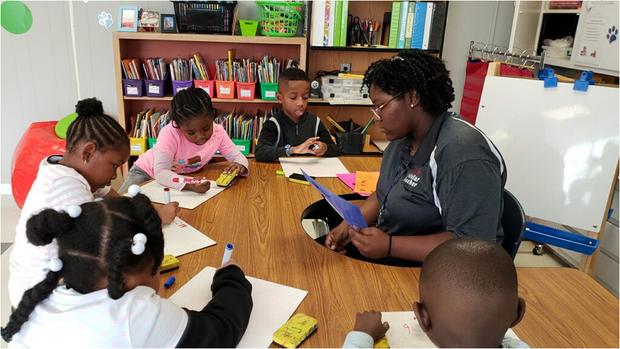 Through their design process, they developed an Academic Support class for each grade level that provides social-emotional support AND targeted academic interventions. This year, the SEMS team has found that the focus on social-emotional learning is critical to student success, particularly in the formative (and sometimes challenging!) middle school years. This April, all ECPS scholars in grades 3-12 took the Panorama Social-Emotional Learning Survey. Through the survey, students answer questions that provide information on key social-emotional skills, such as self management and growth mindset. They also share their impressions of the school climate and how connected they feel to others in the school community. Data from this survey will be used to identify opportunities to create supportive learning environments and positive experiences for all scholars. After successfully piloting the NC Resilience and Learning Project in the 2017-2018 school year, ECPS is partnering with the Public School Forum of NC again this year to expand this work. Four ECPS schools - W.A. Pattillo Middle, Stocks Elementary, Phillips Middle, and Princeville Elementary - receive support from Public School Forum staff and experts in trauma-informed practices to develop trauma-sensitive learning environments. Resilience Teams have been formed at each school, and the teams are piloting strategies like home visits, check-in/check-out times, and safe spaces in each classroom to ensure every student has the support they need to succeed. Our mission at Innovation ECPS is to create the conditions for our students to become transformational leaders - now and in the future. We seek out cutting-edge solutions to our greatest challenges, pilot promising ideas, and scale strategies that work. Click "Follow" and subscribe to this newsletter to learn more!